A number of roads and a car park have been closed in a town centre following the discovery of a man's body. The body, which was initially reported as that of a woman, was found in Eastgate Gardens, Guildford, at about 09:30 GMT, Surrey Police said. They said the death was currently being treated as unexplained and asked anyone with information to contact them. 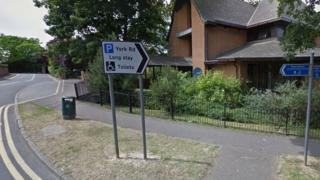 A spokesman said: "The York Road car park is closed while officers investigate the circumstances."